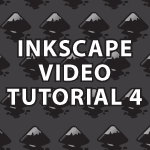 In this part of my Inkscape Video Tutorial I cover most everything about the Bezier tool, Node tool and Inkscape Path Effects. I also cover how to fix the common lxml wrapper for libxml2 is required OS X error. I cover the different types of nodes and paths and how to work with them. I cover every Inkscape Path Effect : Pattern Along Path, Stitch Sub Paths, Bend, Construct grid, Gears, Hatches, Interpolate Sub Paths, Knot, Ruler, Sketch, Spiro Spline, VonKoch and provide examples for each. I. If you press Ctrl + l quickly the force used to simplify will increase. II. You can also set how strong simplify is in Inkscape Preferences -> Misc. A setting above .01 will almost definitely be to high. q. Sometimes it is easiest to move a curve by grabbing the curve itself instead of nodes. ii. This effect crashes Inkscape for me all of the time. Derek, Thanks for all of the wonderful tutorials. I love them. Your pacing is excellent. I’ve been waiting for and looking forward to this one in particular. I do have one question though. When distributing a pattern along a path, is there a way to simply make duplicates of an object that are not in any way deformed and to choose the number and spacing of those objects? Hi Brody, You are very welcome 🙂 I’m glad you are finding them useful. You can get the effect you want, but not with Pattern Along Path. I hope that helps. I’ll cover it in the next tutorial. That works beautifully. Thanks again! p.s. I made your leek soup for my family last week and it was a big hit. I even use it as baby food.